My name is Laurie Farmer. I am one of the communications outreach specialists for the Recovery Program. I take the lead role in that and then I’m also accompanied here by Zack White and he is one of our project managers but he does a lot of the project implementation on the lower segment of the river for the Kansas City District and he’s going to not only talk specifically about the Jameson Island Project, but about some of the other planning projects on the Missouri within this region. Now what I’m going to do is give a little bit of an overview to provide some context of the recovery program, give you a little bit of the history of the Missouri. Some of you guys have lived it, experienced it, but we’re going to talk a little bit about the history and some of the past actions on the river. Some of the past legislation that helped form our program and also the economic benefits that were derived along the river over the years and then also consequently talk about some of the environmental impacts and then we will switch over to Zack and I’m going to hand the ball to him and he’s going to talk a little bit more project specific information. actually even prior to the 1900s, the Army Corp started doing a little bit of work on the river, but in 1912, we had a program called the Bank Stabilization and Navigation Project that was initiated and we’re going to get into a slide set on that so you can actually see what that looks like but this is our series of dikes and revetments that we had put on the Missouri River to help train that river and to help facilitate navigation of the system and help that movement of goods. 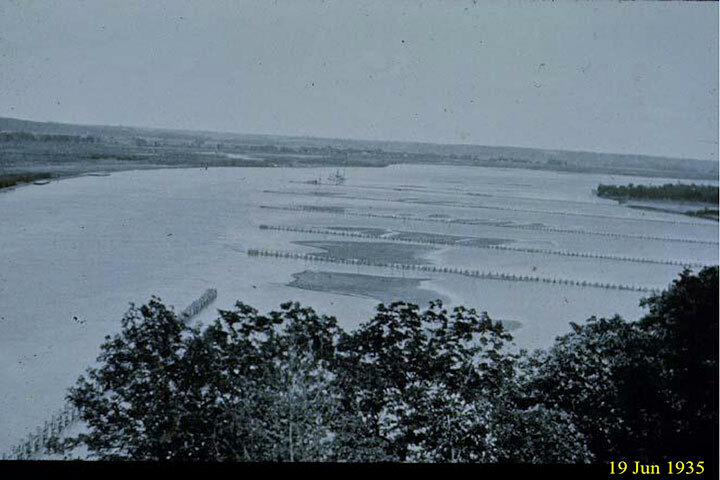 That was one of the major programs that did affect the river over the course of the years. Secondly, I think probably the other largest impact to the Missouri River Basin and the system was the Flood Control Act in 1944. Some of you may have referred to that as the Pix-Sloan Plan. 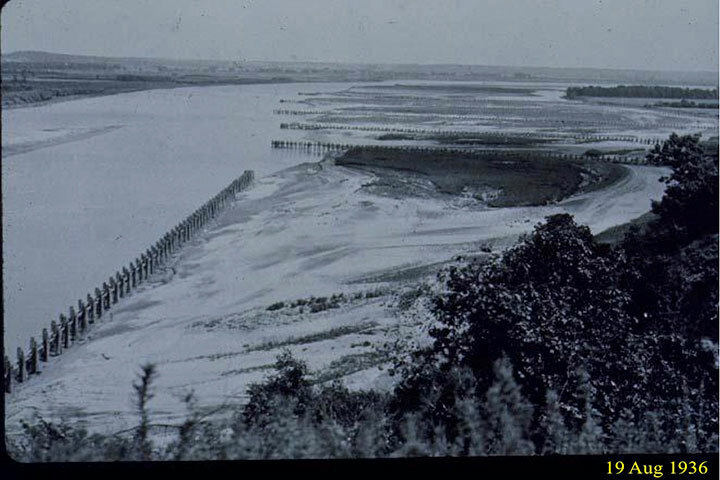 The Flood Control Act of 1944 was really what gave the authorization in the upper portion of the basin to build the reservoir system that we have that helps manage and control that water system. Also through the 1944 Flood Control Act, we did have 8 authorized purposes and the Corp as an agency, we do refer these 8 authorized purposes really quite regularly because what we do is try to balance these 8 authorized purposes. The two primary ones for us are flood control and navigation but we do try to still balance the other 6 authorized purposes and I have them all listed right here on the right. 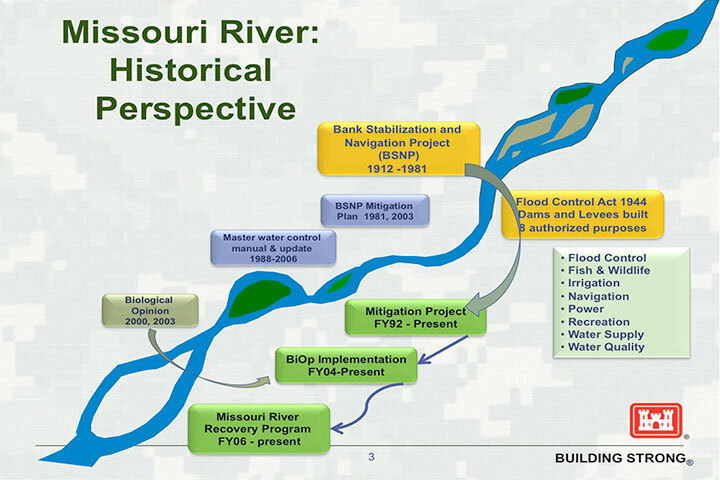 So between the Flood Control Act and the Bank Stabilization Navigation Program, there were kind of a series of more environmental laws that came along and this is really what helped form the Missouri River Recovery Program. Back in the 1980s, specifically in the Water Resources Development Act of 1986, we started seeing our first legislation come through for the Bank Stabilization Navigation Mitigation Project where we are to mitigate for some of the effects of the BSMP. Also through the master water control manual, that was kind of a long time in development to develop the water control manual for the reservoir system, there was a biological opinion that came out of that, too, so between the mitigation projection and then also the biological opinion and the biological opinion is really our agency’s compliance with the Endangered Species Act and we did this in consultation with the US Fish and Wildlife. The biological opinion sets the groundwork for what we are to do and the plan for what we are to do for threatened and endangered species on the river. Let’s kind of get into how this did change the base a little bit. Again, in the upper system, we talk about it as a system of sorts. In the lower river, the lower 735 miles of the Missouri River is where we implemented the Bank Stabilization Navigation Project. We often call it the BSMP. And that is where that lower segment from Sioux City, Iowa basically to St. Louis had become more channelized and more confined and that was really where we had worked on helping with the navigation component and then the upper portions, we do have the reservoir system. That’s another third so in our system of thirds we have the lower channelized portion. We have the reservoir system which is also a third and then we have the remaining natural channel. And just to kind of give you an idea through aerials just to show you some of the changes, I think a lot of you guys are familiar with how a lake system would obviously change a riverine system. Your losing some of the features like side channels, island habitats, maybe some of the slower wider, moving places. Here’s an example of the Lewis and Clark Lake which is the furthest downstream lake at Gowens Point. and when I talk about dikes, they’re done a little bit different now. 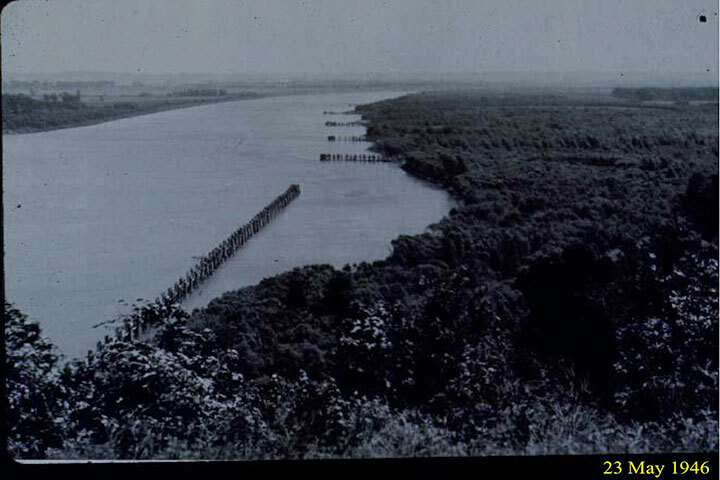 We do it mostly with rock these days but back in 1934, there were more wooden structures so you can see those wood structures marching out into the river right here. This is 1934. This same vantage point, we added a few more dikes here. Here’s that one that was coming in from the bottom and we extended a few more out and you can see over on the left hand side actually it’s doing what it’s supposed to be doing. It’s helping to train that system. It’s helping to confine the flow so we can have more of a reliable channel and really help with the movement of boats up through that area so this is one year later. You see a little bit of sediment accretion. Not even a full later, a lot more sediment accretion for it didn’t take too long for until the sediment started really dumping out behind the dikes and it’s actually really working quite well. This is 1936, one year later. A little bit more sediment accretion behind this and you can see that this channel is actually doing what it was designed to do to help confine the flow and I do want to back up here. I mean everything that the Corp undertakes is something that is authorized to us by Congress. It comes through some form of legislation. So here’s 10 years that have gone by and you can see a pretty dramatic difference in 10 years and how after that sediment starts to accrete then you have a lot of vegetative top cover here in a 10 year time frame. So that was in 1946. We’re talking about 30 years and then in some situations, that does go to private land owners in some situations. The state does take ownership of this but this is a situation where it is obviously going into cultivation after a 30 year timeframe and we did have that vegetative cover removed and it is under cultivation. So this isn’t always the scenario but in a lot of cases, not just on the Missouri River but this happens quite frequently on the Mississippi River that you know the levee protection came also, the land owners wanted to help improve their productivity which makes sense and decrease the flooding so we have something you can see on this one. It looks like a road but it’s actually an access road on top of a levee so there was a lot of instances where these areas did get leveed off to help improve the productivity of the land. So what we had estimated through the Corp and through some of our previous studies is that through the BSMP actually we lost quite a bit of flood plain habitat and it is estimated that approximately 522,000 acres of flood plain habitat were lost and the mitigation project that is a result of that is actually, the legislation was to help replace one-third of that 522,000 so we do have a number that came cumulatively through a couple of Water Resources Development Acts and our total that we are authorized to replace is 166,750 acres. This is a 2013 slide. We just added this so this is the same site, just a more modern day photo so this is fairly new to the slide set. There were a lot of economic benefits to the BSMP. I mean, there was over the years in today’s dollars. We do try to reflect it in actually 2010 cost levels that there was an approximately $35 billion investment through the BSMP through the dike and revetment program and then also through the implementation of the reservoirs but these projects on an annual basis generate about 1.8 billion. You do have other things along the way that definitely benefit from the improvements that were made along the river. You have the benefit of hydropower, the benefit of water supply, the water intakes, flood control is absolutely a benefit along the river and then recreation in the upper and lower and then navigation as well. But there were definitely some changes and alterations to the system. A few consequences as a result. We do have an altered hydrograph of the Missouri River. It is rather than your typical spring snow runoff and mountain snow runoff, we do have the master manual that does help control, that does have more regulated relief and this is the resulting annual hydrograph from that. And then also due to the dams in the upper river, there are changes to sediment input into the system. The Missouri River does have significantly less sediment that is being carried through it’s system. 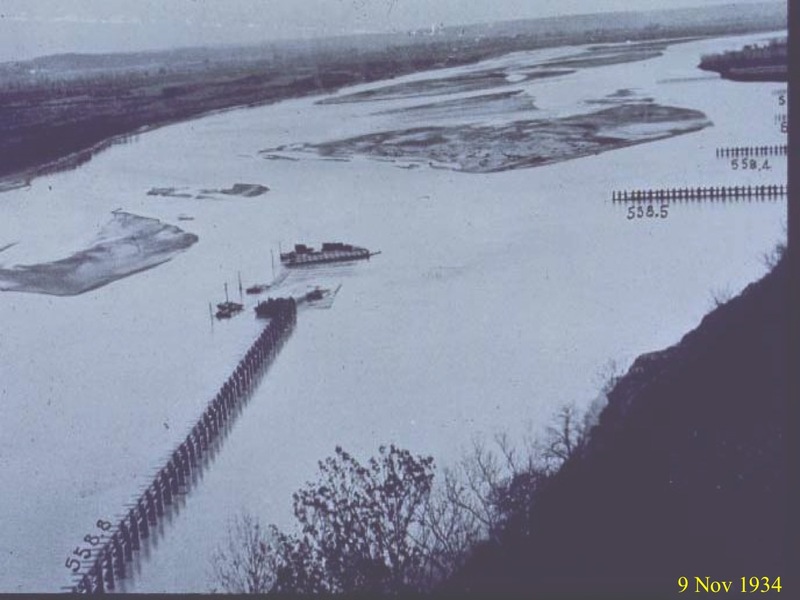 It’s nickname is the Big Muddy and it was a huge supplier of sediment to the Mississippi River and then further on down to the Delta. The Missouri River does historically carry much less sediment in the system now than it did prior to the implementation of the reservoir system and it is on the order of about 80% less that is moving through the system and we just show this graphically right here. Then there is also the environmental consequences. You know our program is really focused on the threatened endangered species. We do have three listed species. Two are endangered and one is threatened and specifically Zack and I are going to talk about the pallid sturgeon mostly and the habitat projects that we have going on towards meeting the needs of the pallid sturgeon and that is a fish species and it is endangered but we do also have implemented habitat also for a couple of bird species. One is endangered and that is the piping plover as well as the interior least tern and that is threatened so we do have the three species that we are focused on for the Missouri River Recovery Program but there are also other native species that have declined as a result as well and a key part of this all is also the aquatic insect species. There has been a decline. You know this is the base of your food chain but there has been a decline in aquatic species too and they’re estimating that that has been reduced by about 70%. So here’s a picture of the three species and the pallid sturgeon is a very pale kind of archaic looking fish. It appears very similar to the shellnose sturgeon. There are a few key differences. I think a lot of it you can’t really differentiate until the fish get older but it is paler in color than the shellnose. And then again as a result of the US Fish and Wildlife, we did work with them on a biological opinion so we do work under an amended biological opinion. The first one came out in 2000, the second one was amended in 2003 and we work with them to comply with this biological opinion so that’s what these habitat improvement projects have going in on the ground. We are trying to comply with this biological opinion and the endangered species act and what the Fish and Wildlife has found is that the operation of the system that we have put in place is jeopardized as continued existence of the pallid sturgeon which was listed as endangered in 1990 so we do go through alternatives to help with those and put the habitat back on the ground and right now we are working with, many of us actually came from a meeting with the Missouri River Recovery Implementation Committee this week and we are working very collaboratively with them. It’s a 70 member stakeholder group that is also has been by law established to help us help guide us in terms of improving our fish in our projects under the recovery program so we are working collaboratively with them right now in developing a new management plan for this species so this is my last slide before I hand it over to Zack, but our current charge right now is we are using the Mitigation Authority, we are using that Authority that allows us to buy 166,750 acres to help us create the shallow water habitat. The shallow water habitat is kind of a fraction of the site development that we actually put in on the ground but we are to create approximately 20,000 acres of shallow water habitat for the pallid sturgeon by 2024 and Zack’s going to talk a lot more about the specifics of the shallow water habitat. My name is Zack White. I’m a project manager for the program so I’m nuts and bolts. 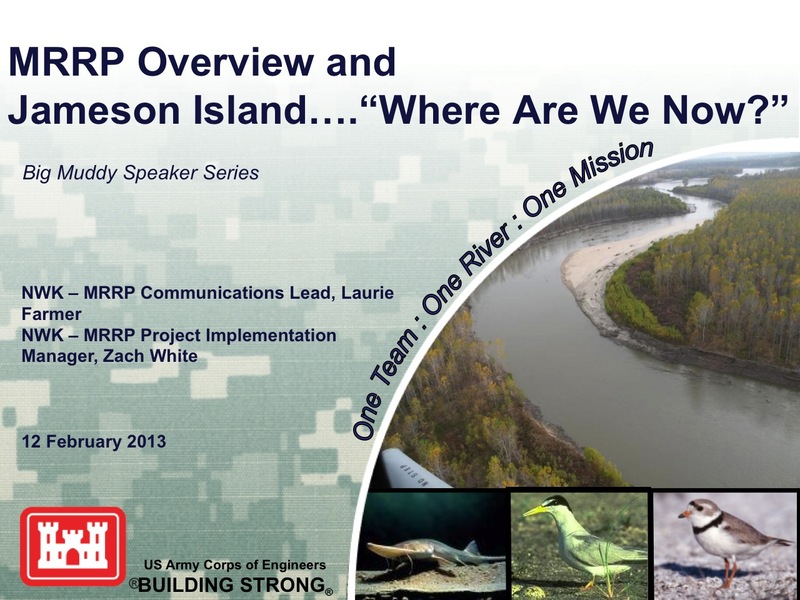 I physically work with teams who actually build the projects and so Laurie gave a great overview of what our program is so I will talk a little bit more about how we implement the projects so specifically what we were asked to do is talk a little bit about Jamison Island. That’s a couple of hundred miles downstream and so I kind of wanted to talk a little bit about that but also talk about some projects that we’re currently doing now and some projects that are in the Kansas City area. So the Jameson Island project is a project that we’ve been working on for several years and this is actually the Jameson Island site. What we see here are the historical locations of the Missouri River and so you can tell from this that the Missouri River used to change courses quite frequently and so these are kind of snapshots in time of where the Missouri River used to be. It’s near the town of Arrowrock which is here and over time, the Missouri River started to migrate away and now this is the current location of the channel and if anybody’s ever been to Arrowrock, it is an extremely exciting town, not exciting, it does have character but it is a very neat town. I mean they have concrete curbs that were laid in the Civil War timeframe so it has a lot of history to it but the Missouri River moved and that’s what the Missouri River did back then and so when it moved, it left the town high and dry and that economic engine of the Missouri River kind of left the town and the town was kind of passed over. The Jameson Island Project, we started a project in 2006 and there was a lot of concern about the method of our construction and at the time, we were putting the soil that we excavated into the Missouri River and there was concern, valid concerns on what are the impacts to that and at the time, we didn’t have a lot of good answers. We knew it didn’t have major impacts to the Missouri River but some of the questions were what are the impacts to for example gold hypoxia downstream and so we voluntarily stopped construction in 2006. Over time, some high water events did the remainder of the excavation for us but we stopped working while we could have an independent science panel review our activities and the impacts those activities would have on gold hypoxia. In the meantime, we also started a comprehensive water quality program and we’ll talk about that a little bit later but what we do is we actually sample the Missouri River and its tributaries at 30 locations monthly while we can while there’s no ice out on the river to check what the ambient conditions are of the river so that we can tell as we do our projects whether or not our projects are exceeding the ambient conditions of the river. While that was going on in 2011, the National Academies of Science, that’s the independent panel that we had do the study to see what our impacts are, they released a report and the findings are that the Corp of Engineers and their shallow water habitat projects are having an insignificant impact on the gold hypoxia and actually one of the quotes were if all the shallow water habitat projects were completed in one year and all that sediment got to the Gulf in Mexico in one year that it would be an insignificant impact. So the Jameson Island Project, it was kind of a shot of the Jameson Island Project and my artist in the room I would like to point your attention to the top photo. This was actually, it’s a watercolor painting. Its a rendering of the unengineered Missouri River channel in 1833 and so Kyle Bordner drew this picture in 1933 and this is what the Missouri River used to look like. Some things to note are a sandbar here, a gently sloping sandbar, and then lots of woody debris around and then a high bank here which may not show up very well here but if you look at the bottom photo, this is the Jameson Island shoot in 2011. You can see that same kind of semblance here. You can see a gently sloping sandbar. You can see lots of woody debris which is just naturally collected in the shoot and then you can see a high bank and so it’s actually a pretty good sight to make a comparison. This is actually what the fish that we’re trying to keep out of being endangered or trying to jeopardize the continued existence is the word. What we’re trying to do is kind of restore that form on some of these sites. So this is the project here. This is the shoot that was completed in 2006. It’s the shoot that you see right here through our rendering here and then our project we started in 2012 is to extend that shoot. This is some of the best habitat that we have on the River. It’s one of our most successful projects and so we’d like to expand on it and so we’ve decided to add another mile to the shoot and so the shoot would actually add about 30 acres of shallow water habitat to the project which is kind of our metric that we’re trying to meet to be able to say to the Fish and Wildlife Service that we are meeting what your biological opinion states we should be meeting. We had lots of public involvement in this process. There was lots of public interest. During this process, we received 700 letters, over 700 letters both in support and both in opposition of the project as well and so between 2012 and 2013, we had a series of meetings, public hearings, Clean Water Commission and with the Missouri Department of Natural Resources and we received lots of good input and we were actually able to work with the Missouri Department of Natural Resources to implement some of their suggestions into our project to make it a more successful project from both our standpoints as well. The public comments we received I said we received a little bit over 700 comments. The vast majority of the comments, they were in favor of us doing the project. The question was really what should we be doing with the material. Should we stockpile it next to the project? Should we dredge it into the river which is what we had proposed. Should we take it out of the flood plain completely. We looked at a larger array of alternatives but the vast majority of comments were not to do the project. There was a lot of support to do the project. It was just what to do with the material. And so I’ll show you a couple of alternatives that we looked at. The top part here is just kind of a cross section of what the Big Muddy Fish and Wildlife Refuge looks like and that’s the property that we are doing the project on and so you’ll see if you walk across the Big Muddy Refuge, you’ll see existing wetlands. You’ll see scour holes. You’ll see low areas. You’ll see areas where there’s just a lot of topographical heterogeneity out there so we looked at three different construction alternatives in our project implementation report. The first which we call alternative to was to dig a pilot channel. We want a channel that will be about 200 feet wide and so our project was to build a project about 75 feet wide and let it widen out over time and what we would do with that material when we excavated the pilot channel? We would stockpile it on the banks as you see here and so these stockpiles ended up being about 15 feet high and a couple of hundred feet wide when you add them together and that would have negative environmental impacts to that existing refuge. You can see that this is just a cross section but it would have impacts to the scour hole areas, the wetland areas that you have across the site. The third alternative we looked at would be to build the shoot to full width so that it wouldn’t erode at all and then to stockpile all of that material outside of the meander zone so that none of the material would go into the river and so you can see that that would have much more impact. We’d have to clear a much larger area to put that material there. The last alternative we looked at would be to dredge the material in the river and what a dredge is is it’s actually, it uses a cutter head and then also a pipe which has flowing water in it to cut the material out of the bank and then to transport the material, the sediment, through the pipe and then discharge it out into the river and so that was the other alternative that we looked at. It would have less impact to the refuge to the wetlands that are out there, and then the question was how much impact would it have to the Missouri River and that’s what we wanted to study as well. Here’s just a quick and I’ll go through this pretty quick, but the impacts of the four alternatives that we considered. Alternative four had the least amount of impact to wetlands to the right timber that we would have to cut down to be able to build a project and then also when we look at flood plain connectivity and also impacts to the adjacent levees. When we stockpile materials into the floodplain, it could have a negative impact on the levees as well so if we don’t have that material in the floodplain, then the flow can pass through our site faster and it could actually lower flood heights on the levees that are across the river or nearby. It’s also the cheapest cost alternative to be able to dredge it and so when we added all those impacts up, less impact to wetlands, less impact to the right perian timber, most beneficial to the levee system and the least cost it was clear to us that that alternative should be the alternative that we move forward with. As I said, we work pretty closely with D&R through this project to come up with some additional modifications to the project to where we could even improve it even further and what we did is we reduced the project by 25 feet. I actually said we were going to construct it 75 feet. Our original plan was to construct it 100 feet so what we did was we shortened the width of the project by 25%, 25 feet, and what that would do it would allow any of the other material to come into the Missouri River in a more natural condition when there’s high water, when there’s a flood, the Missouri River can take on more sediment at that time. We also increased our clearing and grubbing depth and the reason we did that typically what we would do is we would take off the top 18 inches of material and push it over to the side and we decided to increase that a little bit more as a request from the Missouri Department of Natural Resources but that also benefitted us as well because we were able to get rid of some of the tree roots that kind of extend into that lower zone and so it actually resulted in cost savings to the project. Then we also adjusted where we would spoil the material so that top 36 inches that we moved, we moved it into the inside of the bends typically where we would see erosion is on the outside of the bend. We moved it to the inside bends to where it would be least prone to that erosive force. So where are we now? In 2012, the Missouri Clean Water Commission had rescinded an order that they had previously given to us to stop work on the shallow water habitat projects so they rescinded that order in 2013. In April, we signed a finding of no significant impact that our project had no significant impact but we also signed what we have to do with Clean Water Act Section 404 B1 which essentially ensures that we’re doing the least environmentally damaging practical alternative. Also in 2013, we received a waiver from the State of Missouri to be able to construct this project by means of dredging and that is the 401 Water Quality Certification. In July, we led a contract for a contractor to do the construction on site and they began in October of 2013. Currently they are about 50% complete with the excavation. They have all the rock that has been blasted from a nearby quarry and so they are waiting for the ice to secede on the river that the backwater area that they created right now is frozen solid and so as we warm up in the Spring, they’ll start again and they’ll finish construction. Here’s a picture of the dredge and for those of you who have not seen a dredge, this is what it looks like. This is the pipe that I was talking about and so this pipe carries about 85% water and 15 to 20% solid, so 80 to 85% water, 15 to 25% solids and on the front of this is kind of an auger or maybe like a cutterhead which then mixes with the Missouri River water and then discharges it out the back into the Missouri River. Overall benefits of the project, as I said, when we choose alternative 4, it provided the best flood risk management benefits to the adjacent Howard County Levee. The other alternatives if we were to stock that material in the flood plain, it provided the best benefits to that levee. Recreational benefits, there’s lots of recreational benefits to the Big Muddy sites. This speaker series is called the Big Muddy Speaker Series. There’s a Big Muddy Fish and Wildlife Refuge that receives lots of visitors every year so it’s a good thing for the town of Arrowrock. It’s a good thing for those who enjoy those. 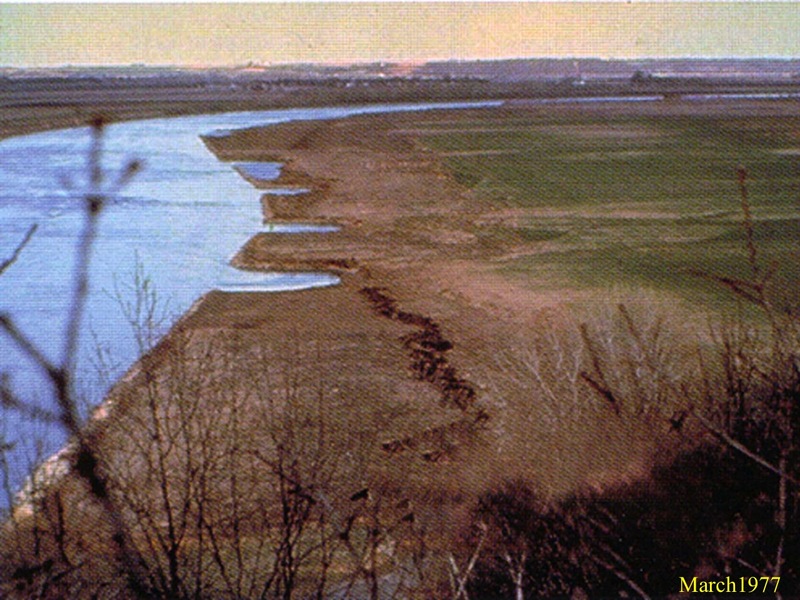 Missouri River Degradation. This is just kind of a side product. I spoke with somebody, Stuart, I don’t see where you are in the back. I spoke with you a little bit earlier today about the degradation problems. You asked me a question and so when we’re able to, the Missouri River is facing serious bed degradation problems and kind of a side result of this is as we’re able to integrate more sediment into the river, it will have some minor benefits to offset some of that degradation problems that we have. To ensure that our project is not having adverse impacts on water quality, I talked a little bit earlier about the ambient water quality monitoring that we’re doing. We also monitor during construction and we monitor four different locations on the river. This 3200 feet that I show down here. We’re not sampling that location but we sampled upstream of the project site to get a current condition of the river. We also sampled at 100 meters downstream, 800 meters downstream, and 1600 meters downstream. We compare those not only to the upstream site but also to the ambient conditions to make sure that what we’re seeing doesn’t exceed any nutrient criteria of the Missouri River but we also scan it for shoaling areas to make sure that the material that we excavate is quickly integrated into the bedload and we also compare it to that ambient conditions that I’ve talked about before. Key messages before I move on to other projects The National Academy of Science has studied. They identify that the projects would not provide a distinct difference in the gulf hypoxia situation. The alternative that we selected is the technically superior alternative. It provides the most benefits to the Howard County Levee district. It is the least environmentally damaging practical alternative and it is also at the least cost to the American taxpayer. The material that we are going to dredge in to the Missouri River, if you remember back to that slide where the Missouri River was changing so much, this is actually material that came from the river at one time so it was once part of the active Missouri River bedload. We’re just simply returning it back to the active Missouri River bedload and then our water quality monitoring and our beth metric surveys that we’re doing, we’re doing that to make sure that the water quality in the Missouri River is safe, that we are not having any adverse impact as well. Does sequestration have an impact on what your planning to do? So sequestration does have an impact on what we do. Typically what sequestration will do is there are several people that were off of work this time last year and we are in a time, its fiscally trying times and trying to get the best bang for our buck but our budgets are being cut and so it definitely has an impact on us. I have a comment and a question. So my comment is you talked a lot about the benefits of the restoration programs. I think it would be beneficial if you were to actually show data to indicate the programs are actually working in the way that you suggest that they are. I’m not suggesting that they’re not, but I think it would be beneficial if you were to do that. My comment is where do we stand and my question is where do we stand in terms of meeting the biological opinion? I think there’s a target that we need to have a certain amount of restoration accomplished by 2025 and I know we’ve fallen behind that but where are we today in terms of meeting those goals? Great questions and so the first comment just want to provide a little more information. I didn’t dive into too many details here but we do have a very robust integrated science program to where we work with the State Fish and Game Agencies. We work with the Fish and Wildlife Service, the USGS, many different agencies to be able to study the fish and to be able to see if our projects are having a direct impact on their survival. We’ve only been doing these recovery program projects since about 2003. The fish is a very long lived fish. It lives about 60 years and so what the integrated science program is trying to do is to find the limiting factor, what’s limiting the fish from being able to survive and so part of that integrated science program is population assessment program so we breed these fish in a hatchery and we release them into the wild and so what we’re able to find out is that when we release them into the wild at about age 1, they survive just fine and so we’ve kind of narrowed down the window and we actually think that the window is narrowed down into the first 30 days of life. Something happens in the first 30 days of life that is precluding the fish from surviving and so we’re focusing our efforts on figuring out what the limiting factor is and we’re hoping to be able to figure that out and then the second part of that is we have an adaptive management strategy to where we can fluidly change our strategy so that if the fish needs a different kind of shoot or if it needs different dynamics or if it needs, maybe its not shallow water habitat at all. Maybe it’s something else. 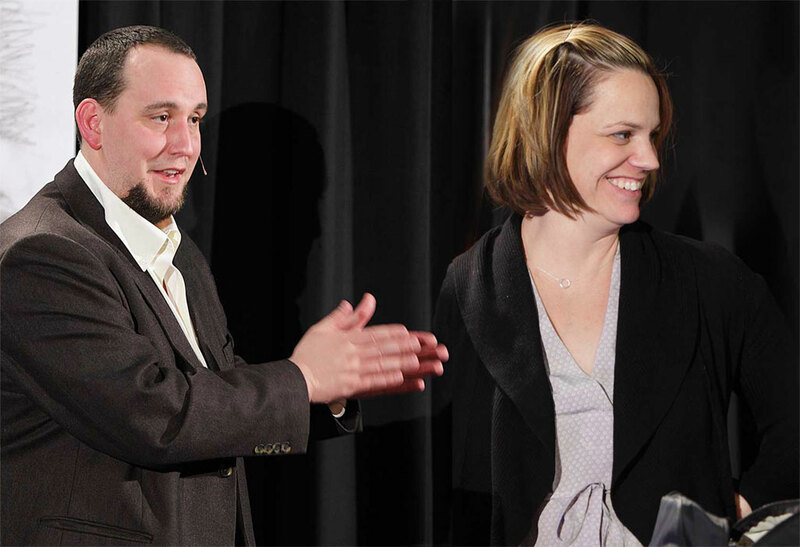 Our strategy is we have an adaptive management strategy which allows us to kind of change with the times. The last thing that you asked was about our metrics and so we actually are undergoing a survey. We had a check in with the Fish and Wildlife Service every five years. 2014 is our check in year. We anticipate we’ve done lots of survey to be able to measure the amount of shallow water habitat on the system and early estimates are that we’re doing just fine with that check in date. The last date that we have to check in so it’s 2014, 2019, and 2024 but the last check in date those are just kind of milestones along the way to make sure we’re there but we’re good in 2014 is what I would say without having all the data done. Tom Hopkins. 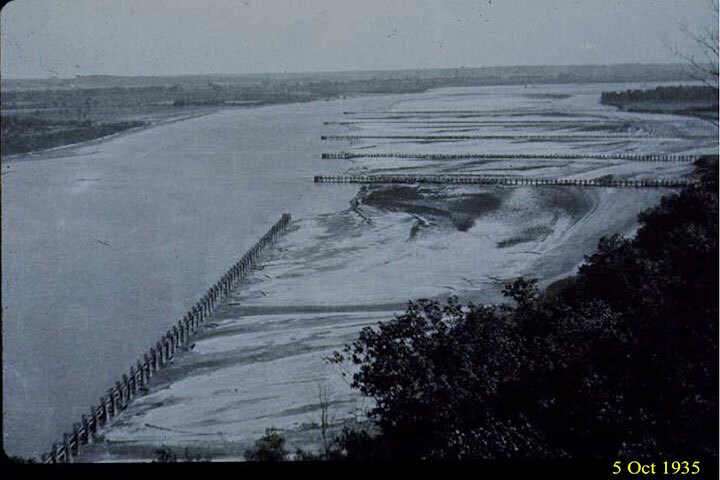 Earlier in the presentation, it was mentioned beginning in the 30s, the period of time when impacts were determined, as the channels being altered, there was land built up as a result of the dikes. It was also mentioned that some of that land went into agricultural cultivation. As it stands now, is there agricultural acreage adjacent to the executed or planned projects and if so, what is being done for runoff monitoring and abatement. Good question and so I’ll give you a couple of facts and then I’ll hopefully answer your question. So when the Corp built the bank stabilization and navigation project, we actually constructed as a result of it, we constructed 522,000 acres of flood plain habitat so we converted what once was Missouri River or sandbar habitat and converted that into land and over time, that would either go to the state or go to a private land owner and then sometimes that would be converted into agricultural land. Typically what we do is we would buy an entire bend. 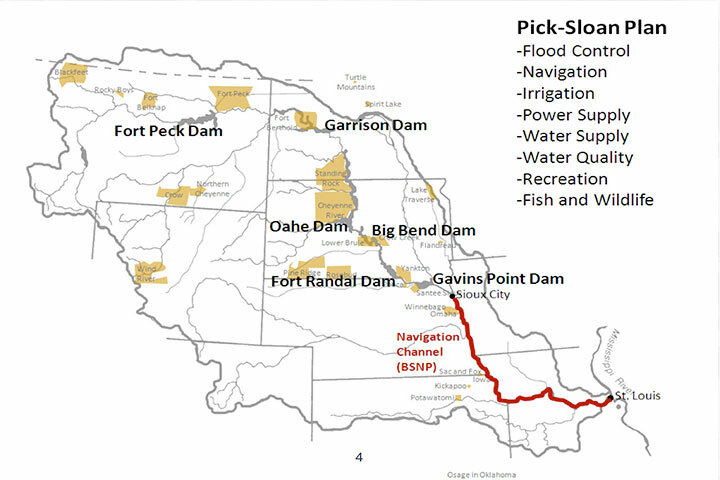 If you look at some of our projects, they’re several hundred, 16, 1700 acres and so we buy the entire bend of the Missouri River to be able to construct a project on that site and so while there are projects sometimes in the upland hills, there’s none in the flood plain. For the projects that are upstream of our project, where there may be some runoff that enters our site from upstream, our goal with this program, or one of the, its not a goal of our program, but one of the side benefits of our program is that on the remaining acres, lets say we have a project that’s 1600 acres and we develop 100 acres for shallow water habitat, the remainder of that site, the 1500 acres is turned into wetlands or into right perrian areas or into areas that could clean up that runoff and so our project, while we are building it for shallow water habitat has far reaching benefits. Zack, can you tell me why you decided on building shallow water habitat if you’re not sure that the fish are going to survive in there? So what we do is we use the best available science. We actually started the project in the year 2000 and in the year 2000, the first proposal was to build shallow water habitat or gain shallow water habitat by changing the flows and so in 2003 that was kind of met with some consternation and in 2003, we decided that rather than changing flows and having impacts to agriculture or to navigation or to some of those economic benefits that we get from the system, we decided to mechanically build shallow water habitat and while shallow water habitat is where we are still investigating the needs to be able to determine whether it fixes that original 30 day, potentially limiting factor, what we do know is that shallow water habitat is beneficial to the pallid Sturgeon as it gets past that 30 days and its also beneficial to all native Missouri River fish and so we’re studying that original 30 days. We know that shallow water habitat’s going to be beneficial as it ages but where we’re focusing our efforts is in that original 30 days to figure out what we need to tweak to be able to make all of our projects beneficial for the fish during that entire lifespan so it’s beneficial for the pallid Sturgeon. We’re just not sure if it fixes that original 30 days and so we’re studying that and we actually have a management plan and it’s what’s called an effects analysis to be able to study all of this to be able to more efficiently and effectively implement our program. I hope that answered your question but it may not have. How did you get to shallow water habitat? How do you get to shallow water habitat? At the time, in 2003, that was what the science was telling us. This is what we need to create to be able to offset or to be able to take the fish out of jeopardy of continued existence and so that’s what the leading science was telling us at the time. So I’ve heard a lot about what their finding out and telemetry on the fish that they release and some of the things I’ve heard are that they seem to want cooler water to spawn in and they go up the tributaries and then they come out of those and they need a shallow water habitat but there’s a theory that there’s not enough sediment for them because they’re more susceptible to predators. It gets very, very complicated and you guys putting the sediment back into the river but it’s nothing really that stays. Do you have more sediment in your shallow water habitats? I guess you’re gonna find out this year you know a more definitive answer as to what’s been going on so far but what does it look like that needs to be done? So a couple of things. What we do know about the fish is that it evolved or developed in a much different system than what we have today. It was much more turbid. It was much more shallow and there were a lot of different temperatures. Even the substraight of the bed was different than it is today and so as we take a look at all of these, what we try to do is restore some of those natural processes and so when we build a project like Jamison Island, we actually allow the shoot to meander across the flood plain again and then to kind of come to that natural harmonious shape that it would like to be in and so we restore the form and the function on those sites of what the Missouri River used to be like and so the theories that as we restore that form and the function, that that will be beneficial to the fish. That’s one way of looking at it but you know what we’re doing is we’re using the best science that we have to be able to tweak this as we go. My question is what’s the percentage of Corp resources dedicated to like mitigation and restoration and habitat compared to the resources that are spent on maintaining the channel and taking care of all those dikes and all that and then also like is the philosophy going forward to increase the percentage going to mitigation, restoration, or how’s it going to go? I think everybody here has asked a tough question. We’re gonna have to quit the tough questions. If anybody has any softball questions you want to lob me, I’ll take them. So we’re talking two different things. 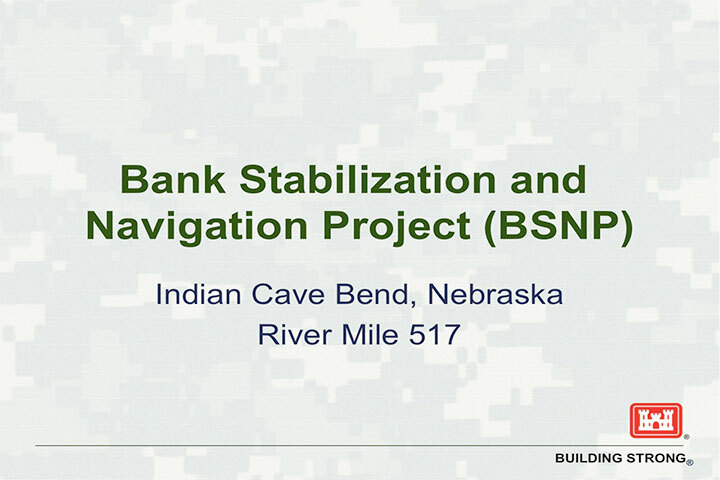 The bank stabilization and navigation project was started construction in 1912 and finished in 1980 and so we’re not constructing that project any more. All we’re doing is maintaining it and so while we spent several, I think the number was $35 billion in 2010 dollars for the bank stabilization and navigation project and also for the dams, right now we’re in a much different timeframe. It costs a lot of money to build your house but to maintain it every year it’s a lot cheaper and so for both mainstem reservoir system, the bank stabilization and navigation project, we spend about $110 million dollars a year to maintain it. In the past few years, the recovery program has gotten about 70. This year it’s $58 million. It kind of varies each year but last year we got $72 million. This year we got $58 million to be able to buy the land, do the science, and build the habitat. So you hit on part of it right there and it’s important to understand that the Corp does not have a giant pot of money that all of their projects come out of. Every project gets allocated a certain amount from Congress and so saying that you’re gonna take money from one aspect of what the core does and not do that anymore so then that money will be available for other things just does not follow because Congress has to approve it and as we all know, budgets don’t really work that way. The Jamison Island Project was hugely controversial and can you tell me what the status of that is and are the other projects that you’re working on, Benedictine, did those experience the same kind of controversy or do you plan to fight this battle over and over and over again as you go down the river building these things? You know, so time will kind of tell how much we have to fight. With Jamison Island, it was a two year long process and I don’t want to say fight but it was just a process of public engagement and so we were able to move forward with the project so for Jamison we’re about 50% complete. Benedictine didn’t receive as much public involvement. It was a pretty minor project. I think we received less than 20 letters providing comment on Benedictine Bottoms and so that moved to construction fairly quickly as compared to Jamison Island. I think time will tell. As I said, we’ll be putting some projects out on public notice this spring and so we will see what time has for us or what these projects have for us. I’m sorry I don’t believe in asking anything but tough questions but I think she brought up a good point. You had a list of the 8 authorized purposes and you described the economic benefits associated with those but I mean historically the Corp has not done a good job describing sort of negative impacts of some of the water quality and the environmental consequences. You had a slide that showed something like 75% of the fish have been negatively impacted by some of the processes so those really should be sort of negatives in the column. I guess my question is where do we stand? A few years ago, we were going to reevaluate those 8 authorized purposes and maybe sort of balance those. Where do we stand in that because right now, I mean even today, those aren’t balanced. Even the mitigation amounts that we’re spending now do not balance against what we’re spending for flood control and navigation. Is that going to happen? What do we need to make that happen? Where do we stand on that? So we actually had two studies that we were scoping or in the process of doing. The first was what we call Mr. ERP. It’s the Missouri River Ecosystem Restoration Plan and the second one was Mr. APS. 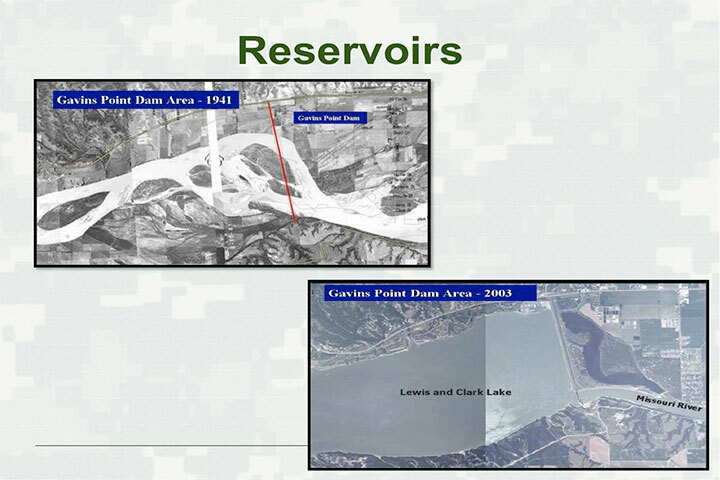 The Missouri River Authorized Purposes Study. So we had those two projects that we were working on and the Corp of Engineers is we are a mission oriented organization. We get our mission from Congress and so Congress does two things. One is it provides us the authorization to be able to do a project. It says Corp of Engineers, we need you to do this. Here’s the scope. Here’s what you need to do. Go do it. At the same time, they also have to provide us the money to do it and so those are two different things that happen. They give us the authorization to do it and then they give us the money to do it. What happened in both of those instances is we had the authorization but we are prohibited from spending resources on them and so we currently aren’t working on those at all. What they were going to do, one of those when you talked about fish and wildlife, the reason it was kind of absent from there when we talked about the benefits from the navigation or from flood control or from hydropower, one of those benefits that we’re going to try to quantify was the benefits to fish and wildlife. So basically those programs became unfunded even though they’re still authorized and I don’t really know all the history of it. What I have heard is that there were interests in this state and the question earlier too was about restoration in Missouri basically versus Kansas is what you were asking and no there is not as much opposition in Kansas. There’s a large agricultural community in Missouri that’s opposed to a lot of this with a lot of misleading ideas one of them being that if you don’t spend money on this, you can spend money on that. It seems like those purposes will work together but Missouri has always been heavy, heavy on navigation. It was Missouri that basically got the navigation and bank stabilization program going and efforts out of Kansas City over many years and stop and go effort. Navigation by the time the channel was done, it never really materialized but we’re still, we push it heavily and we don’t see that here but if you go down to Washington and St. Charles and St. Louis, there are barges everywhere so there is a lot of navigation on the river. There’s not much at all from Kansas City North, if any, maybe one boat every other month. So what I heard was navigation was worried that they would be put on the back burner and they were on the front burner. What we really need to do is do is we need to petition our congressman to pursue the authorized purposes study to see what we’re doing today versus what we did before and whether or not these actions actually make sense. A lot of this stuff has to go together. The really big dichotomy is keeping water in North and South Dakota for hydroelectric and irrigation versus water down in the lower river for navigation but basically for at this point, recreation. One of the things we’re trying to do here in Kansas City is connect people more to the Missouri River because our river communities down river and up river that are very much more engaged in the Missouri River. We’ve kind of turned our back on it. A lot of this was the result of the stock yards and pollution that was allowed and basically the reputation that the river got but we really do need to reassess the authorized purposes and take a serious look at not just who thinks they’re most important, but economically and culturally what nowadays are most important to the people that are using the river. That’s my soapbox. That wasn’t a question. This is Bern Hopkins with the Missouri Department of Natural Resources and I understand that the issues that you’re point out, Larry, but I would have to expand I think on a couple of areas that are probably worth noting. 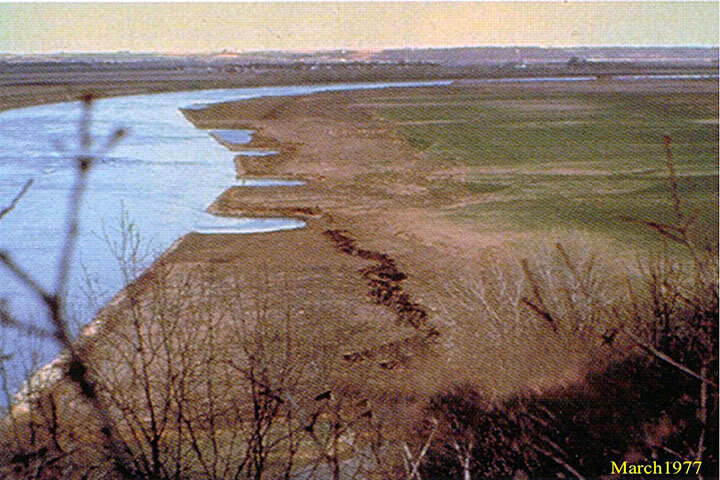 In the original picture that was pretty dramatic that was shown where it is shown the amount of reduction with the river, the river’s about 30% the width that it was originally and then that area became developed over the last 75 years and a lot of those areas became hardened with levees and significant agricultural production is occurring there so there’s not to be trivialized economic footprint and there’s a lot of development that’s gone on especially when you talk about going near St. Louis and some of those areas. There’s been a lot of development behind those structures in that flood plain. Frankly development on top of accreted land. At one point in time, the river would have owned but that was 75 years ago so we’re dealing with a river that we have essentially matured as a nation around a river that we boxed in. There’s no doubt about that and that’s one of the issues that Zack is attempting to do here is to bring some level of biological function back to that system, but I think it’s important to recognize that the water intakes for the utilities, both drinking water and for coal plants are also constructed in relationship to the river that we have out there right now and the flow regimes that come out of that river are supportive of a very, very large economic engine that’s on the Mississippi River in terms of those flow regimens that’s helped support navigation and on that which is mind boggling the economic footprint. You close and locking down on the Mississippi River for 24 hours and you cause millions if not billions of dollars worth of economic repercussions so when we look at this very tough problem, there’s no doubt that we’ve changed that river over a course of 75 years but I think we have to equally challenge ourselves to look at what we’ve done in relationship to the river as it exists today and it’s not an easy situation to untangle or even consider reversing and so these projects that Zack is working on are compromises. They’re looking to get a focused biological function back in areas where we think we can but I do think that when we look at the purposes of the river, flood control, and navigation, etc., it’s not really any more about whether or not there’s a barge running up and down the river every three minutes. It’s all the infrastructure that’s been built up around a system that was designed to carry to optimize the movement of waterway traffic so it’s complicated. Hi, Zack. That was not an easy little diatribe so I would like to say this. I am a big fan of the public process and as Zack pointed out in his scoping meetings that there were numerous opportunities to go and weigh in on these projects that the Corp is putting forward or that Fish and Wildlife is putting forward or that the Port Authority of Kansas City’s putting forward. I mean these are huge efforts that have a public participation component and we are that public. I really encourage you from my soapbox to get involved in that at whatever level that you can. If that’s coming to this meeting that’s great. I suggest we take it further. Brian brings up a good point and that’s one that we kind of gloss over a lot and that is the amount of water that the Missouri River contributes to the Mississippi River system and it is an essential amount and the authorized purposes, we’re not gonna change the channel. At most, we’re looking at possibly moving some levees back basically giving the river more room to operate as a river so that we don’t end up with the situations like we have before where we end up with flooding because the levee just pushes the water farther downstream. I have a real problem with economic development behind the levees. We trust them. We think that we build a hill between us and the water and it’s going to be permanent. Well, history has shown us that that’s not. It’s really not a good idea. We shouldn’t be in the flood plain personally speaking and economically speaking, you know when the disaster happens, the disasters big. The recreation as a recreator, I am very much in favor of the bank stabilization program and the channelization program. I can get in a kayak and not put a paddle in the water and I could float to St. Louis without hitting bank because of the way that river is engineered and it’s an essential part. Now if I’m taking a motorboat down there and I try to do that, I’d be hitting sunken sandbars. You know we’re talking about the past history and one of the big problems with the river and the navigation when they were using it basically to move people and commodities to go West, was the fact that the river does change all the time and that’s why they did what they did to it but I don’t think we should be any of the people that are interested in any of the purposes should not be afraid to hear what the public has to say because it might not go with what they think because the only way we can do this, there’s $10 million people that live in the Missouri River watershed and the only way we can do this viably is for all interests to be represented and to talk about it so tough, tough situation for the Corp of Engineers. When they started this navigation project you know way, way back in the 1890s, they didn’t have the information that they really needed and what we have learned over time. You know, they were looking at navigating and making it easier to get up the river. Whose looking at birds and fish? They’re everywhere. Well not anymore and now we’re realizing why and so over time, we continue to learn and that’s why adaptive management is so important and that we’re so glad that the Corp has accepted adaptive management in all of their programs and basically that’s how they run these days. So get involved, sign up on the Corp website for all the notices, and voice your opinion.